Renowned engineer, Ben Booker, employed an Allen & Heath Qu-16 compact digital mixer to sub mix 8 channels of keys with scenes at the Stephen Lawrence Unity concert, held at the O2 Arena in London last weekend. "I used the Qu-16 as it gave me an option to run each song as a different scene, so levels, EQ and compression could be change per artist," Booker explains. "I also used the QuPad app to remotely mix the keyboard levels and adjust compression and HPF on channels in rehearsals." 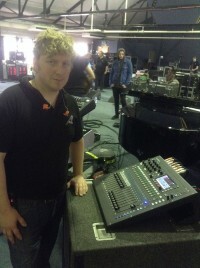 In picture: Ben Booker with the Qu-16.